Fr. Cidouane Joseph, OFM, and Fr. Erick Lopex, OFM, pose with Cardinal Theodore McCarrick (center) after their ordination to the priesthood. Presiding at the 11 a.m. Mass was Cardinal Theodore McCarrick, archbishop emeritus of Washington, D.C. He was assisted by Provincial Minister Fr. John O’Connor, OFM, Provincial Vicar Fr. Dominic Monti, OFM, and Fr. Thomas Conway, OFM, director of post-novitiate formation. Family and friends of the newly-ordained priests participated in the celebration. They were joined by parishioners of St. Patrick-St. Anthony Church in Hartford, Conn., and St. Camillus in Silver Spring, Md., where both men have served. 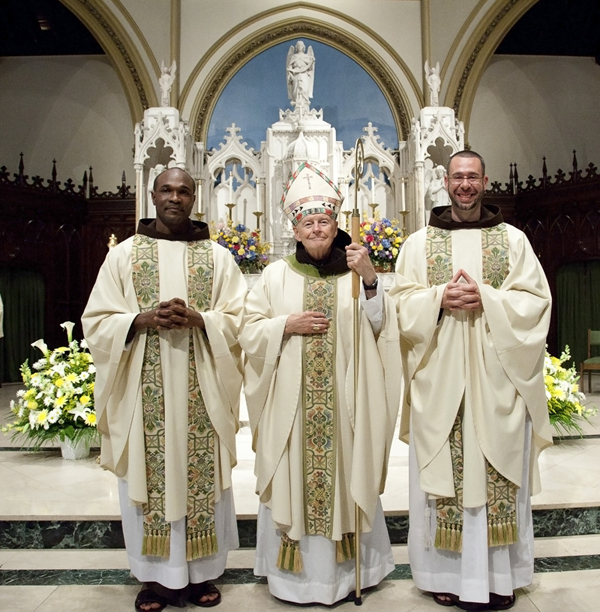 For me, the occasion reflected the rich cultural traditions of both friars being ordained. The scripture readings and music were in French, French Creole, and Spanish, and Cardinal McCarrick directed his remarks in Erick and Cid’s native languages. It was a wonderful representation of the internationality of the Franciscan Order, as well as the cultural diversity of the friars of Holy Name Province. A native of Cuba, Erick holds a bachelor’s degree in radiochemistry from the Instituto de Ciencias Nucleares de Ciudad de la Habana. He converted to Catholicism at age 21 when he and his family got to know the Daughters of Charity of St. Vincent de Paul in Colombia. After moving to the United States in 1999 and settling in Hialeah, Fla., Erick became acquainted with several friars involved in Holy Name Province’s Ministry of the Word. Erick, 38, earned a master’s degree in divinity this spring from Washington Theological Union and will serve as parochial vicar of St. Camillus Church in Silver Spring, Md. Regarding his upcoming assignment, he said, “I have been involved in parish ministry and liked it very much. I want to be present to people as the people in my life have been present to me.” He may join the Ministry of the Word team.